Visions of obtaining our own personal outdoor oasis, complete with top of the line audio and visual equipment, can be extremely tempting, sometimes even leading us to make quick decisions when it comes to the solutions we choose. However, when it comes to outdoor TVs, specifically Ultra High Definition and 4K, there are important considerations to be made – namely ensuring the TV is weatherproof and can offer the highest resolution. With the fall season comes the return of football and outdoor BBQs. For many of us, we still want to enjoy the last bit of warmth for the year, but without missing the game. Lucky for us, outdoor AV is now even more advanced, offering TVs that are not only weather-proof, but also provide crystal clear resolution. 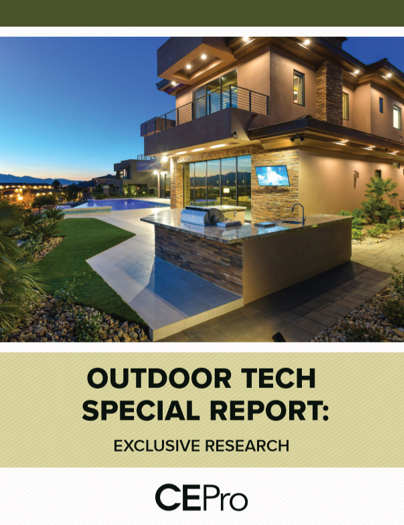 Still, when visions of comfortable seating, a great game, and the electronics that enhance the experience overload our minds, there are important considerations to be made, especially with outdoor tech. And, throwing any TV outdoors simply does not work. Before you purchase any outdoor AV solutions, I have some recommendations for you to get the most out of them. Weather resistance is the most important factor that should be taken into consideration before purchasing an outdoor TV or speaker. Your outdoor TV needs to withstand the extremes that weather can pose because certain scenarios can make or break the life of your TV, such as torrential rain and tremendous temperature fluctuations. To withstand this, look for TVs that have a weather-proof design and anti-reflective coatings to combat sunshine. An aluminum body is also ideal as it withstands extreme temperatures and provides anti-rust and anti-corrosive features. In addition, IPS panels that provide color and picture accuracy along with high temperature limits allow placement in any outdoor environment. Finally, TVs with no filters or vents means they are maintenance free. Once ensuring your TV is ideal for outdoor use, there are a few more considerations to review. Wanting the highest quality TV is certainly a strong desire, however, the fact is not all TVs can truly support 4K resolution. The answer is looking for a TV that supports HDMI 2.0 and HDCP 2.2. Every step in your process must support HDCP. Think of it like a digital handshake or a chain link. For example, if you run your HDMI connection through a home theater receiver or sound bar, it must be HDCP 2.2 compliant, and for any device that is not, it breaks the chain, preventing you from seeing 4K. HDMI 2.0 is also required for 4K. However, not every device that supports HDMI 2.0 supports HDCP 2.2. Not having both is the ultimate deal-breaker. Peerless-AV’s UltraView™ UHD Outdoor TV is the best of both worlds and the ultimate must for an outdoor oasis – the new line of TVs are equipped with 4K resolution and provide a crisp, clear picture, even in bright ambient light. The UltraView™ UHD Outdoor TV is the next generation of Peerless-AV's UltraView™ Outdoor TVs, offering a powerful and durable outdoor entertainment solution. With 4K resolution and support of HDMI 2.0 and HDCP 2.2 for increased compatibility with 4K sources, the UltraView™ UHD Outdoor TV provides unparalleled picture clarity. With a high TNI and IPS panel, the UltraView™ UHD Outdoor TV thrives in all conditions and sun positioning, without the risk of isotropic blackout or loss of color accuracy. Withstanding temperature fluctuations from -22°F to 122°F, the UltraView™ UHD Outdoor TV offers users confidence in quality and performance. Its aluminum construction provides the ultimate defense against weather and discoloration. There is no need to change filters or service the TV, creating a maintenance-free outdoor entertainment solution. Available in 49", 55", or 65", the UltraView™ UHD Outdoor TV's internal speakers provide excellent sound without detracting from the TV's aesthetics and an expanded input compartment offers additional space for housing third party extenders or control devices. The UltraView™ UHD Outdoor TVs also come with a waterproof and dustproof universal remote that can be programmed to control up to three additional devices.